We got a call from the Southern Tier Rose Society last month to let us know that June has been named National Rose Month to recognize American grown roses, our national floral emblem. The International Cut Flower Growers tell us that roses are grown in all fifty states. I told the society member that I would put up a display on the second floor of books we have on growing roses but doubted we’d have enough of just rose books and would have to supplement it with other gardening books. 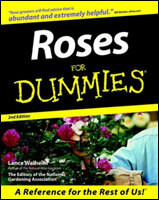 To my suprise, when I started to look in our catalog, I found many, many books specifically on growing roses; everything from Roses for Dummies to the American Rose Society Encyclopedia of Roses. We also have Roses by Peter Coats which is a book of illustrations of roses in the botany section; Rose Sampler Supreme by Rosemary Makhan which is a quilting book of rose patterns, and Pruning Basics by David Squire which includes how to prune roses. I’m not a gardener but Jackson and Perkins’ Beautiful Roses Made Easy: Mid Atlantic and New England Edition might make me try my hand at it. This entry was posted in Recommendations, Uncategorized and tagged recommendations, roses by ccld. Bookmark the permalink. ← Previous Previous post: Tips to get started in genealogy! Next → Next post: West Elmira – Check Your E-Mail & Check Out This Book!